The new variant was a big improvement over the T-72 series, and also was going to be offered for foreign sales on a nearly equivalent model to the Russian one – the T-90S. Previously the Soviets had marketed downgraded versions (derisively referred to as “monkey models” as they were so simple monkeys could operate them) but with the failures of the T-72M and T-72M1 variants in Iraq they had little choice. The Indians were their first major customer and bought 300 of the new tanks, followed by at least 300 more later. The Russian Army was not as quick to buy them for a myriad of reasons, and surprisingly has only purchased around 700-800 of them over 20 years of the tank’s production run. 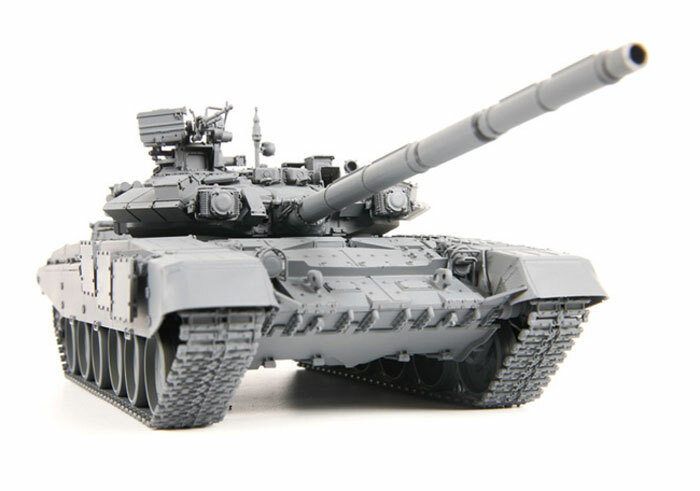 The T-90 has been produced in four basic models. The first two were the T-90 Model 1992 and its equivalent foreign sales version, the T-90S. But in 1999 UVZ introduced a new all-welded turret to replace the B model’s cast/welded turret with a state-of-the-art one that is easier to upgrade. The new tank was dubbed the T-90A Model 1999 and the equivalent export variant is the T-90SA. Over the years the tank has been continually upgraded as well, and the engine has gone from a V-84M of 840 HP to first the V-84MS and then the 1000 HP V-92S2. The “S” on the latter two engines means “silfon” or a tube that draws fresh air into the exhaust to suppress the tank’s infrared heat signature, which is shown by a completely new exhaust port on the left side of the tank. Also “Shtora” which originally included two IR searchlight/missile suppression jammers on the front of the turret has replaced them with more reactive armor boxes. Most visible to most people was the replacement of the RMSh single-pin “dead” tracks with the new UMSh twin-pin “live” tracks (called the “Universal” track as it will be the only large tracks in use when all tanks and tank-based AFVs are upgraded). 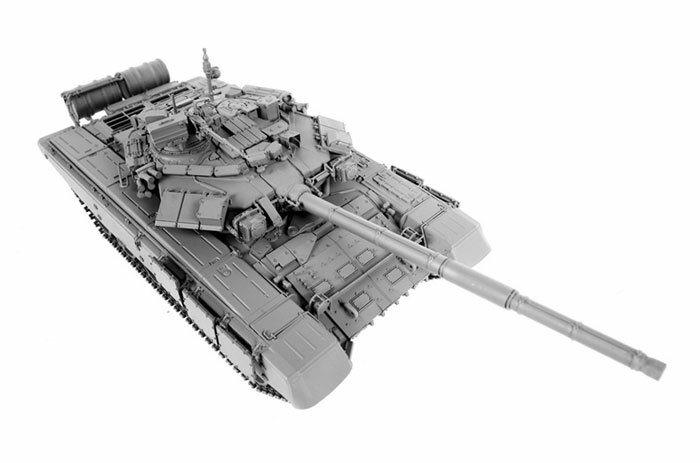 Zvezda has now released a beautiful new kit of the T-90, which turns out to be an early production T-90A Model 1999 with the universal tracks. It is fitted with the full “Shtora-1" kit as well as a V-84MS/V-92S2 engine with the suppressed exhaust system. It also mounts the initial fit of the “Kontakt-5" built-in reactive armor system on the hull and the turret wedges and supplemental “bricks”. 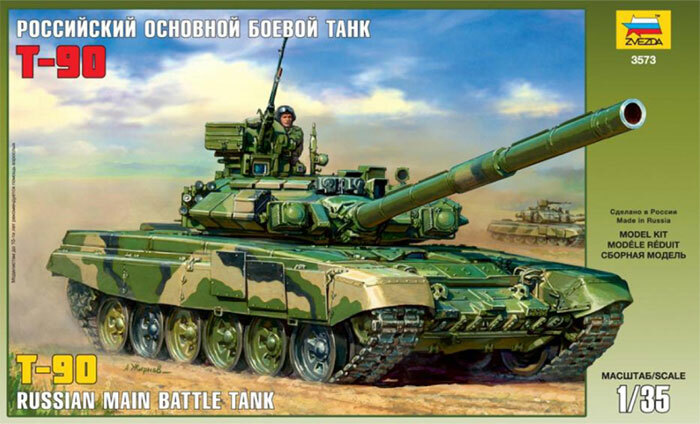 One of the first reviews of this kit came from Aleksey Khlopotov on his blog site “Gur Khan Attacks!” Aleksey was not very kind to the kit as he approached from an engineering standpoint and concluded it mixed T-90, T-90A and T-90SA features together. However, it should be noted that Aleksey worked for many years at the Nizhniy Tagil Metallurgical Testing Institute (NTIMI) and was much closer to the tank and its designers than any of us in the West could ever be. So how is the kit? It would appear that Zvezda has determined this will be their “flagship” armor kit and have lavished a great deal of work in trying to get it right. Just to begin with, instead of the usual flimsy “tray and lid” box the kit comes in a flimsy lid but sturdy tray that is closed with an internal cover similar to a Western “pizza box” lid. The moldings are among the best I have seen from Zvezda and the detail is quite petite – even the front fender mudguard springs are separate parts and nicely done. Nitpickers will be happy to find that the engine radiator grilles are offset to the left! The T-90 series adopted road wheels which were 10mm wider than the T-72B ones and the kit reflects this with the latest variant of the “six bolt” wheel sets. The UMSh tracks are quite interesting – they are “link and length” but have their hollow guide teeth molded as separate sections that are attached by the modeler. Even the tooth attachment bolts are present. Oddly enough construction begins with the turret. The turret consists of a base, a roof, and four side sections to capture the detail (Zvezda is, like most eastern companies, not equipped with the slide molding equipment used in Asia). Sights have clear styrene windows provided or alternate armored covers. The commander’s cupola both rotates and the hatch is moveable; the loader’s hatch is only offered as optional poses. Turret interior is minimal and consists mostly of the controls for the 1EhTs29 commander’s cupola armament controls. The main gun is fixed and a two-piece barrel (top and bottom) but should clean up nicely with a Flex-I-File. Each “Shtora” searchlight consists of 13 parts (note that when “on” they glow with a dull orange like some unprocessed 35mm film frames). Note that if you wish to make an Indian T-90SA the left bin (assembly 10b) is actually a condenser for the air conditioning system and has a long rectangular vent with grille mesh over it on its bottom edge. For reasons nobody can figure out part F103 is missing from nearly all of the kits released by Zvezda so far. This is part of the remote drive for the NSVT heavy machine gin remote mount and not an easy one to replace. You may have to contact Dragon or Zvezda (or their exporters) to receive a replacement part. The hull assembly does not start until Step 19 with the rear radiator louvers and grilles. I suggest replacing the nylon mesh with etched brass or extruded aluminum as it is more correct. Ditto in Step 23; Zvezda got the interior of the rear radiator air exhaust vents correct but the nylon mesh is not the best choice to cover them. The hull is more detailed than the older Tamiya T-72M1 hull and offers more options. But the lower hull consists of two sides, the belly plate, and the rear plate so is more complex than its predecessor. Unlike Tamiya it also provides the six lever-action shock absorbers with their actuating arms – the T-72M1 kit only had four but did not provide the linkage. Zvezda puts the tracks on the way I do (!) which is to install the inner row of road wheels and return rollers, the inner ring of the drivers and the inner idler wheel. The latter should be left loose on its axle (e.g. not cemented to the hull) until the interim track section (parts C35/36) is joined to the “wrap” section (parts D59/4) and the arrangement is set. In Step 29a I suggest replacing the nylon string with twisted steel wire (picture hanging wire) to get the proper look and flex to the tow cable. The kit offers two finishing options: one in overall “Soviet Khaki #2" or “protective green” with bort number 251 or one in the more common tricolor sand/black/Khaki #2 finish. These are keyed to Testor ModelMaster paints with 1710 being their callout for Khaki #2 and 1749 (flat black) and 1795 the other two. A “Number Jungle” sheet of decals is provided as well as two “Guards” badges. Overall, while our friend Aleskey may wish it was better this kit is by far the best one from Zvezda yet and in many areas superior to the old Tamiya T-72M1 kit. With the use of after-market kits such as the Miniarm T-90 Model 1992 turret and Fruil RMSh tracks, a model 1992 may be produced from the kit. But kudos to Zvezda for a superb effort.